Peckforton Castle is not a castle. OK, so it was built to look like a castle, but in Victorian, rather than mediaeval times. Notwithstanding, its’ imposing elegance has been the backdrop for stylish Cheshire wedding receptions for around ten years. The baronial hall, the room where most wedding receptions are held, has – shall we say – interesting acoustics. For any live band to perform there successfully, they must be experienced in attaining a good sound; otherwise all guests will hear is an unlistenable mush. Luckily for Mark and Jessica, they hired Hard to Handle band! With literally hundreds of wedding receptions performed at, we know how to achieve a great overall sound in even the most challenging of rooms. And that bride, groom, friends and family enjoyed themselves on the dance floor is testament to our skills, we feel. There was a little surprise in store for Jessica, when her father got up and jammed on guitar with us for a few numbers – all planned in advance, of course, but it made for a real highlight and it was lots of fun. We’re looking forward to our next visit to Peckforton Castle; in the meantime we have lots of other wedding receptions to perform at. 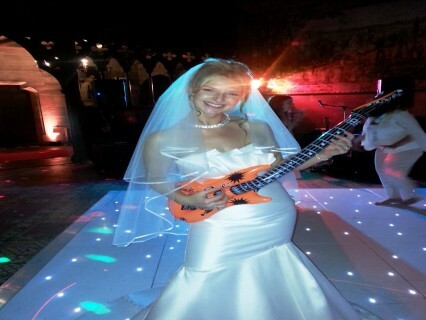 If you’re looking for a live band for your function, why not do what Mark and Jessica did, and give us a call?